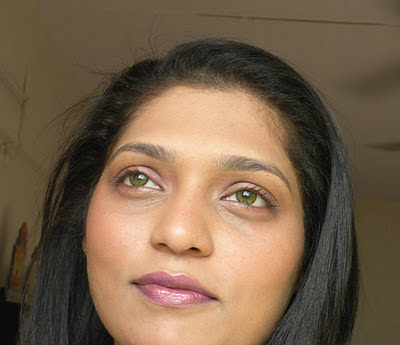 Hope you all had a gr8 week, lotsa stuff to share wid you folks but todays just a quick post on one of new lippie that has been quick to secured a place in my favorite collection. I was as always making a futile effort to surpass the cosmetic counter but Chambor being one of my favourite brand for lippies and also considering the fact it has been a long time (A month back :P) since I shopped for Chambor beauties so I decided to just take a peek and phir kya tha, I came across this beauty and just had to have it :D It's called Truly Murve, 903 and it's a very pretty pinkish murve colour. It's a very subtle colour n can be worn at anytime of the day. It goes well with Indian as well as western attire. The lasting power is around 5-6hrs and even after it fades it leaves behind a just bitten colour on my lips. really nice shade.......... suits u nicely..
pretty shade..loved the last pic..!